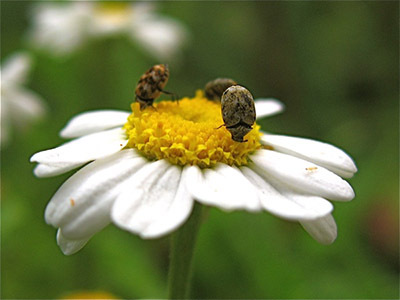 "I recently captured this shot of these tiny beetles on a 'feverfew daisy' in my garden," said Ruth Cooper. "These flowers which are about 1/2" in diameter, are honey-scented, and are very attractive to insects. These little fellows, (about the size of a pin-head,) apparently weren't about to miss the last drop of nectar!" OMG, i saw your Aperture thing on Apple.com! That is so awesome..... :D And BTW, very nice shot Ruth! Yes, Apple really liked the John McDermott interview (that I mentioned here the other day). They featured it on their Hot News page. It's a good listen if you haven't checked it out yet. And yes, great shot Ruth!